Ages and Stages: Working Safely and Well Together [WEBINARS] FREE! Aging Workforce in Canada Fast Facts Card [PROMOTION TOOLS] NEW! AirAssess Â– Improve Indoor Air Quality at Work* [APPS AND SOFTWARE] NEW! Arthritis & Workplace Health: Ensuring Employees Reach Their Full Potential [WEBINARS] FREE! Assembling the Pieces Toolkit [COURSES/E-LEARNING] FREE! Being a Mindful Employee: An Orientation to Psychological Health and Safety in the Workplace [COURSES/E-LEARNING] FREE! Best RTW Practices for Workers with Musculoskeletal and Mental Health Conditions [WEBINARS] FREE! Bullying is Not Part of the Job Sticker (pink) [PROMOTION TOOLS] NEW! Business Case for Health and Safety [COURSES/E-LEARNING] FREE! Business Case for Workplace Wellness [COURSES/E-LEARNING] FREE! CHEMINDEX [DATABASES] FREE on the WEB! Client Lifting Fast Facts Card [PROMOTION TOOLS] NEW! Creating Healthy and Safe Workplaces Bookmark [PROMOTION TOOLS] NEW! Day of Mourning Commemorative Pin (Clouds) [PROMOTION TOOLS] NEW! Day of Mourning: Lisa Kadosa's Story [PODCASTS] NEW! Emotional Intelligence at Work [WEBINARS] FREE! Flu and Infectious Disease Outbreaks Business Continuity Plan [PUBLICATIONS] FREE! GHS Classification and Labelling Webinars Package [WEBINARS] FREE! GHS Classification of Mixtures: An Introduction [WEBINARS] FREE! GHS Classification of Substances: An Introduction [WEBINARS] FREE! Hazard Control Fast Facts Card [PROMOTION TOOLS] NEW! Healthy Habits That Work [WEBINARS] FREE! Healthy Workplaces: A Team Effort [WEBINARS] FREE! How to Write a GHS Label [WEBINARS] FREE! ILO Encyclopaedia of Occupational Health and Safety [DATABASES] FREE! Implementing Healthy Eating Programs in the Workplace [WEBINARS] FREE! Keeping Healthy for the Long Haul Fast Facts Card [PROMOTION TOOLS] NEW! Learning by Committee: Accident Investigation [WEBINARS] FREE! Learning by Committee: Effective Committees [WEBINARS] FREE! Learning by Committee: Workplace Hazards [WEBINARS] FREE! Learning by Committee: Workplace Inspections [WEBINARS] FREE! Listen up: Chemical Exposure and Hearing Loss in the Workplace [WEBINARS] FREE! Make the Move: Staying Physically Active at Work [WEBINARS] FREE! Manual Materials Handling: Risky Business [WEBINARS] FREE! Mental Health: Awareness [COURSES/E-LEARNING] FREE! Mental Health in the Workplace [WEBINARS] FREE! Mentally Healthy Workplaces: Strategies for Success [WEBINARS] FREE! Mould, Spores and More: The Real Deal [WEBINARS] FREE! Musculoskeletal Disorders (MSDs): Awareness [COURSES/E-LEARNING] FREE! Nanotechnology and Health [COURSES/E-LEARNING] FREE! Occupational and Environmental Cancer: Recognition and Prevention [COURSES/E-LEARNING] FREE! Occupational Health, Safety and Environmental Management Systems: Awareness [COURSES/E-LEARNING] FREE! Ontario Bill 168 - Violence & Harassment in the Workplace [WEBINARS] FREE! Preventing and Enforcing Musculoskeletal Hazards in the Workplace [WEBINARS] FREE! Protection from Pesky Summer Pests [PODCASTS] NEW! Psychological Health and Safety: An Action Guide for Employers [WEBINARS] FREE! Psychologically Healthy and Safe Workplaces - Workplace Factors [PROMOTION TOOLS] NEW! Radiation Safety in the Workplace [WEBINARS] FREE! Supporting Mental Health in the Workplace [PODCASTS] NEW! Taking Action on Workplace Stress [WEBINARS] FREE! Vehicle Survival Kit Fast Facts Card [PROMOTION TOOLS] NEW! Violence in the Workplace: Awareness [COURSES/E-LEARNING] FREE! WHMIS 1988 Classifications [DATABASES] FREE! WHMIS 1988 Fact Sheets [PUBLICATIONS] FREE! WHMIS 2015: An Introduction [COURSES/E-LEARNING] FREE! WHMIS 2015 Fact Sheets [PUBLICATIONS] FREE! WHMIS 2015 - How Canada is Adopting the Globally Harmonized System of Classification and Labelling of Chemicals (GHS) for Workplace Chemicals [WEBINARS] FREE! WHMIS 2015 Instructor's Toolkit [PUBLICATIONS, TRAINING TOOLS] NEW! 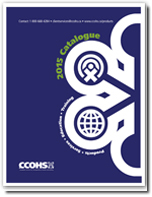 WHMIS 2015 Participant Workbook [PUBLICATIONS, TRAINING TOOLS] NEW! WHMIS After GHS For Employers [WEBINARS] FREE! Work-Related Asthma: Breathe Easier Â– Part 1 [WEBINARS] FREE! Work-Related Asthma: Breathe Easier Â– Part 2 [WEBINARS] FREE! AirAssess Â– Improve Indoor Air Quality at Work* NEW! Assembling the Pieces Toolkit FREE! Being a Mindful Employee: An Orientation to Psychological Health and Safety in the Workplace FREE! Business Case for Health and Safety FREE! Business Case for Workplace Wellness FREE! Musculoskeletal Disorders (MSDs): Awareness FREE! Occupational and Environmental Cancer: Recognition and Prevention FREE! Occupational Health, Safety and Environmental Management Systems: Awareness FREE! Violence in the Workplace: Awareness FREE! CHEMINDEX FREE on the WEB! ILO Encyclopaedia of Occupational Health and Safety FREE! Day of Mourning: Lisa Kadosa's Story NEW! Just a Bump or a Ganglion Cyst? Protection from Pesky Summer Pests NEW! Supporting Mental Health in the Workplace NEW! See Signs of Violence at Your Workplace? Aging Workforce in Canada Fast Facts Card NEW! Bullying is Not Part of the Job Sticker (pink) NEW! Client Lifting Fast Facts Card NEW! Creating Healthy and Safe Workplaces Bookmark NEW! Day of Mourning Commemorative Pin (Clouds) NEW! Hazard Control Fast Facts Card NEW! Keeping Healthy for the Long Haul Fast Facts Card NEW! Psychologically Healthy and Safe Workplaces - Workplace Factors NEW! Vehicle Survival Kit Fast Facts Card NEW! Flu and Infectious Disease Outbreaks Business Continuity Plan FREE! WHMIS 1988 Fact Sheets FREE! WHMIS 2015 Instructor's Toolkit NEW! WHMIS 2015 Participant Workbook NEW! Ages and Stages: Working Safely and Well Together FREE! Arthritis & Workplace Health: Ensuring Employees Reach Their Full Potential FREE! Best RTW Practices for Workers with Musculoskeletal and Mental Health Conditions FREE! Emotional Intelligence at Work FREE! GHS Classification and Labelling Webinars Package FREE! GHS Classification of Mixtures: An Introduction FREE! GHS Classification of Substances: An Introduction FREE! Healthy Habits That Work FREE! Healthy Workplaces: A Team Effort FREE! How to Write a GHS Label FREE! Implementing Healthy Eating Programs in the Workplace FREE! Learning by Committee: Accident Investigation FREE! Learning by Committee: Effective Committees FREE! Learning by Committee: Workplace Hazards FREE! Learning by Committee: Workplace Inspections FREE! Listen up: Chemical Exposure and Hearing Loss in the Workplace FREE! Make the Move: Staying Physically Active at Work FREE! Manual Materials Handling: Risky Business FREE! Mental Health in the Workplace FREE! Mentally Healthy Workplaces: Strategies for Success FREE! Mould, Spores and More: The Real Deal FREE! Ontario Bill 168 - Violence & Harassment in the Workplace FREE! Preventing and Enforcing Musculoskeletal Hazards in the Workplace FREE! Psychological Health and Safety: An Action Guide for Employers FREE! Radiation Safety in the Workplace FREE! Taking Action on Workplace Stress FREE! WHMIS 2015 - How Canada is Adopting the Globally Harmonized System of Classification and Labelling of Chemicals (GHS) for Workplace Chemicals FREE! WHMIS After GHS For Employers FREE! Work-Related Asthma: Breathe Easier Â– Part 1 FREE! Work-Related Asthma: Breathe Easier Â– Part 2 FREE! From publications bearing your corporate logo to e-courses customized to your specific workplace to databases mounted on your corporate intranet, we can customize almost anything to suit your workplace health and safety needs! Contact Us for details. Want to know if a CCOHS product or service is right for you/your organization? Simply complete the Request a Demo form and we'll get in touch with you to set up a free, no obligation demonstration. Applicable taxes are added during Check Out. Order online using our secure e-commerce system by visiting the individual product pages. An e-commerce account is required for all online purchases. It allows you to track your orders and makes your future transactions easier and faster. In order to complete your purchase, you must use one of the following browser versions: Internet Explorer 11, Google Chrome 30 or higher, Mozilla Firefox 27 or higher, or Safari 8 or higher. Other browser versions may not be compatible with the SSL security standard used by our online payment system. Charges vary depending on the product being ordered and the shipping method selected. Details are shown in the order summary before the purchase is finalized. Discounts and Special Offers, are calculated automatically when ordering online. We accept online payment by Visa, Mastercard and American Express. To request a refund on eligible products and services, contact CCOHS Client Services at 1-800-668-4284 or online. CCOHS reserves the right to refuse any return. CCOHS Products and Services can also be ordered through one of our Worldwide Authorized Distributors.